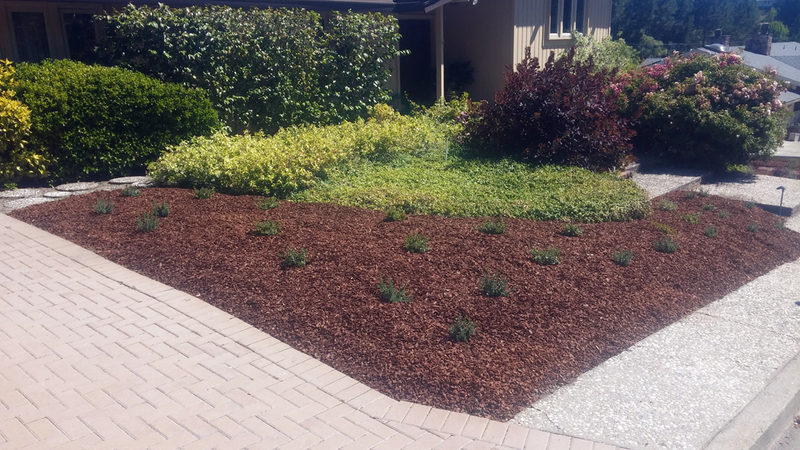 This is another way of removing a lawn, smothering it with newspaper or cardboard and a thick layer of mulch. 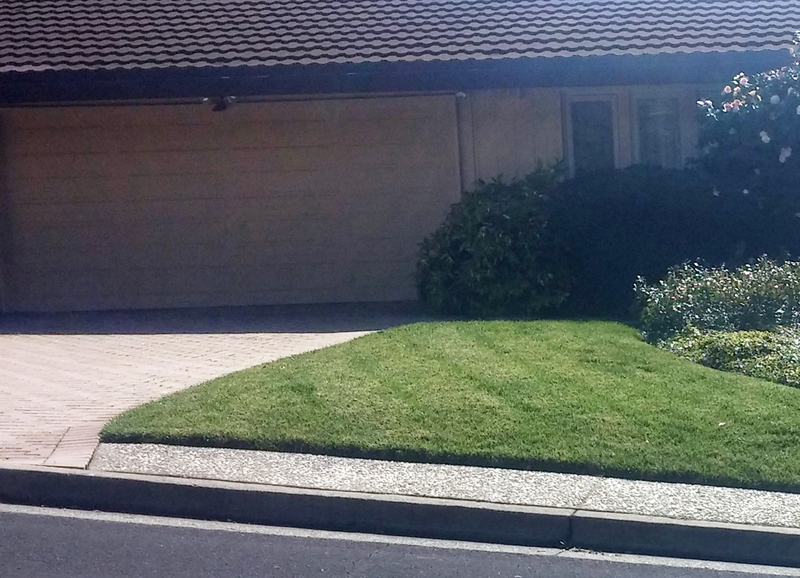 I’ve posted about this in the past, but my proselytizing is an ongoing thing; I think it’s the most efficient way to convert a lawn. Now that the drought has ended (temporarily? ), I suppose people might lose interest in taking out their lawns, but so far the momentum seems to be continuing. 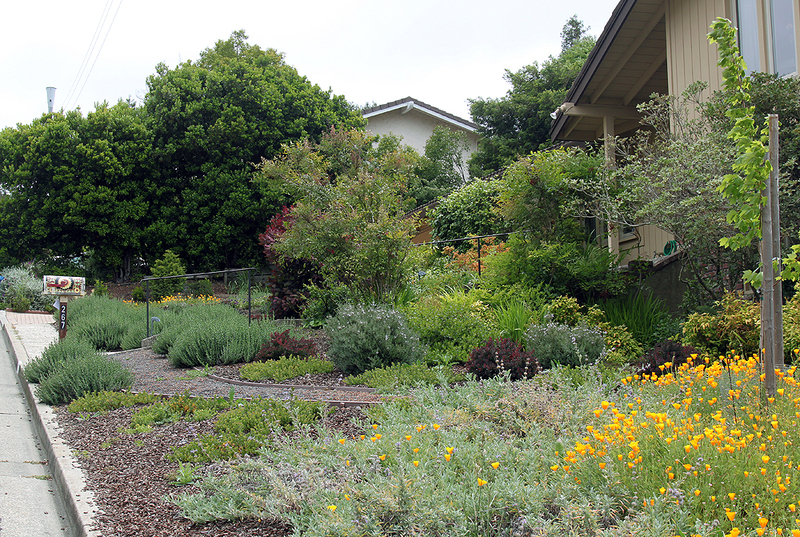 It helps that EBMUD still has its rebate program. 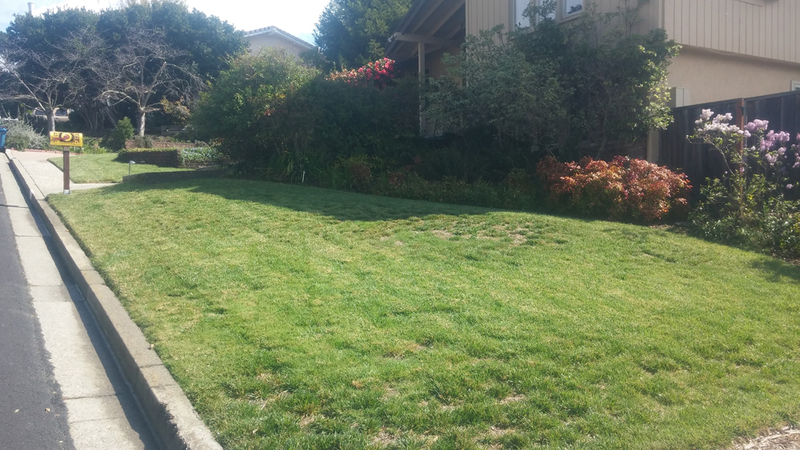 We started by turning off the irrigation and letting the lawn dry out in the sun for a couple of months. 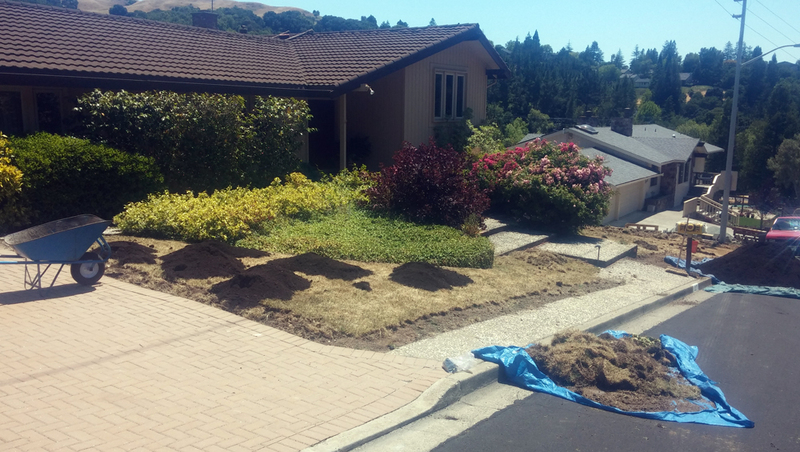 We left most of the lawn in place, but we did dig out the edge of the lawn so the mulch wouldn’t spill onto the sidewalk. I then used the dug out pieces of sod and some compost to make a berm towards the back of the planting; I put the new tree in the berm. 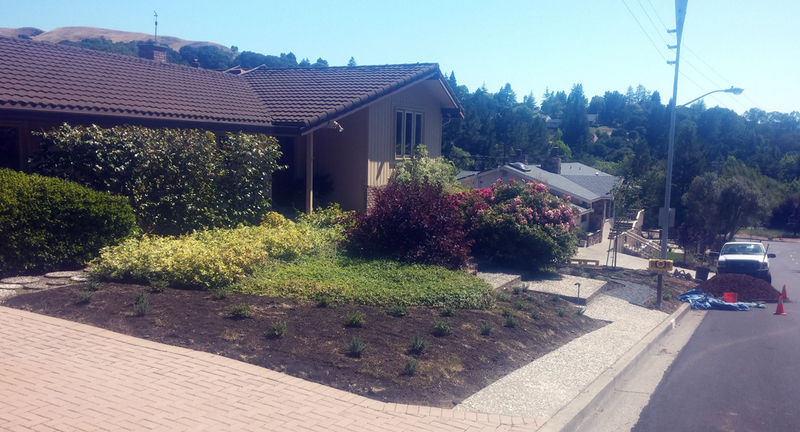 The berm always settles a fair bit after the compost and sod decompose, but it gives a subtle bit of topography to the new planting, helping it look a little less like a former lawn. After digging out the edges, we spread about an inch of compost over the rest of the lawn and then planted directly into it. That generated another little pile of old sod, which I added to the berm. We then covered the ground with a layer of wet newspaper, 8-12 sheets thick and overlapping by about 4 inches. I presoak the newspaper in a bucket as I go, so that it sticks together like paper maché. 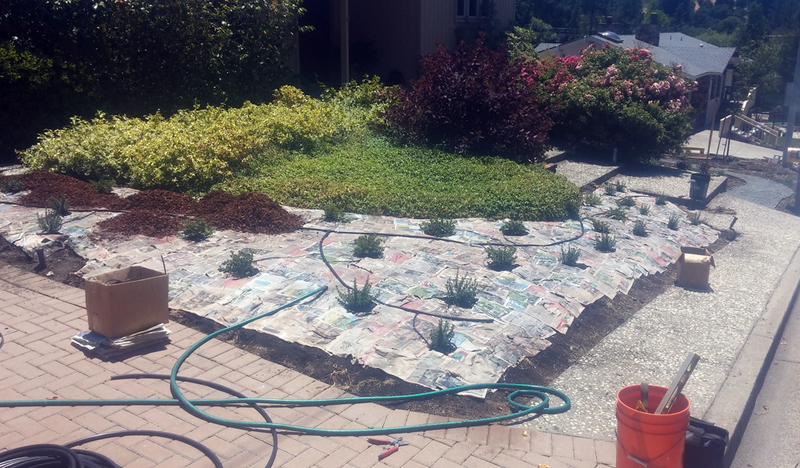 We then run our drip irrigation on top of the newspaper and then cover everything with mulch before the paper can dry. A bit of the lawn manages to fight it’s way up through the layers of newspaper over the next few months, but a couple of quick maintenance visits can deal with that, plus the new plants will also suppress the old lawn as they grow in. 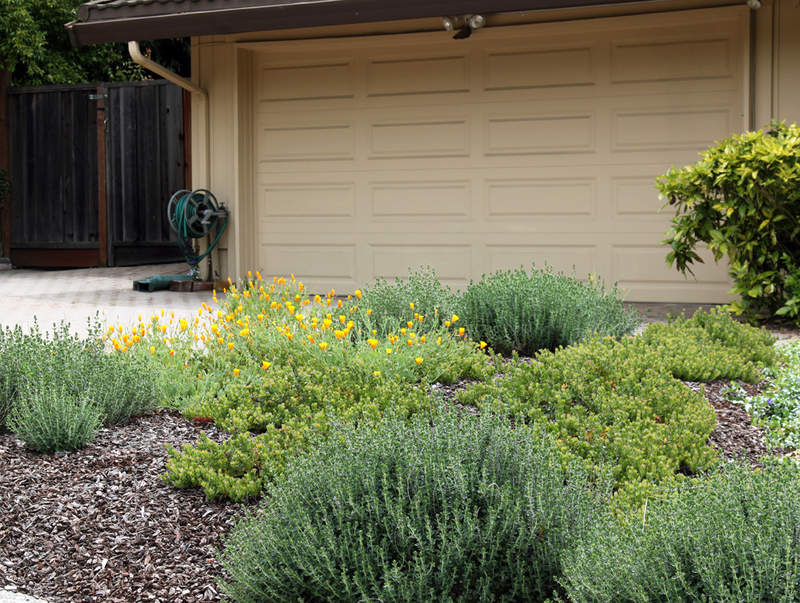 It all takes a lot less labor than digging out the entire lawn, and the lawn and newspaper layer enrich the soil as they decompose. The newspaper also takes advantage of the fact that roots go through it but the tops of plants do not. The poppies scattered on top of the newspaper layer can send roots down into the soil, but any existing weed seeds cannot push their way up from beneath it. Simple and efficient and so much better than mowing and watering a lawn. This entry was posted on Wednesday, June 7th, 2017 at 7:48 am and is filed under lawn to garden, private gardens. You can follow any responses to this entry through the RSS 2.0 feed. You can leave a response, or trackback from your own site.